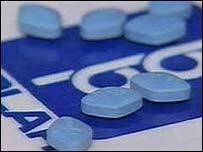 More than 20 million men worldwide have used the drug since its launch in 1998. A spokesman for Pfizer, the makers of the drug, said the company was considering changing its warning on the drug label. "We are in discussions with the FDA to update our language to reflect these rare ocular events that have occurred," said Daniel Watts. He said that men who took Viagra often already had those types of diseases that could cause blindness. There have been no reports of the condition among 13,000 people tested in clinical trials for the drug. The condition, known as nonarteritic anterior ischemic optic neuropathy (NAION), causes a rapid reduction of vision and can, in the most serious cases, lead to blindness. Dr Howard Pomeranz, co-author of a report on the condition published in the Journal of Neuro-ophthalmology in April, said the drug had long been linked to sight problems. Viagra was known to cause temporary colour changes in some men's vision, he said, but NAION was a much more serious condition. Dr Pomeranz said the problem may have been underreported as most people would not think to mention to their ophthalmologist that they were taking the drug. "When patients see their ophthalmologist at the time they are examined for loss of vision how many of them would think to bring up the fact that they are using a drug like this to an eye doctor?" He said men could avoid the condition by undergoing a simple screening test. Dr June Raine, of the UK Medicines and Healthcare products Regulatory Agency, said it had only received six reports of adverse reactions to Viagra resulting in blindness, including four of optic neuropathy. In contrast, about 900,000 patients had been prescribed Viagra in the UK. Dr Raine said the issue had been kept under review by European regulators, but as yet there was no firm evidence that Viagra caused eye problems. "Anyone who has concerns about their eyesight should speak to their doctor. "The best advice is always to make sure that Viagra is prescribed under a doctor's care and supervision. "Patients are very unwise to get their supplies over the internet."